I love picnics! And I’m so lucky to have a lot of great places I can go to get out in nature and relax with a delicious meal. Since I usually have to take my food from home everywhere, a picnic is super simple for me. I have a lunch tote that has the essentials and I just add in something for eating outside depending on whether it’s during the day or evening. Since Jeff eats differently from me, we put his food with mine and off we go. 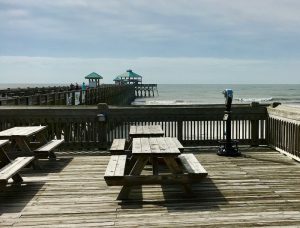 One of our fav places is the picnic tables on the pier at Folly Beach. All of you probably know that by now from my beach pics! We love taking our breakfast there, watch the sunrise then eat our morning meal. But we’ve been known to go to our local parks since we have an abundance of nice places to choose from. Then there is always downtown Charleston with all its beautiful spots perfect for a little outside R&R. But we are also very lucky to live by the river. The dock going out over the water is a perfect place to take our little picnic and enjoy watching people zoom by in their boats or sitting back and gaze at a beautiful sunset. Do you like picnics? If so where is your favorite spot?